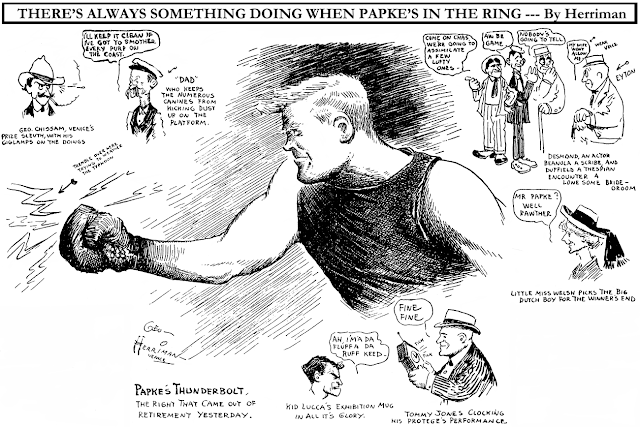 Thursday, September 3 1908 -- Herriman draws some of the goings-on around Billy Papke's training camp. Papke's big title bout with Stan Ketchel is scheduled for next Monday. Connie, June 6 1937, courtesy of Cole Johnson. My extremely limited Spanish language skills make learning anything substantial about Tito y Chita rather difficult. 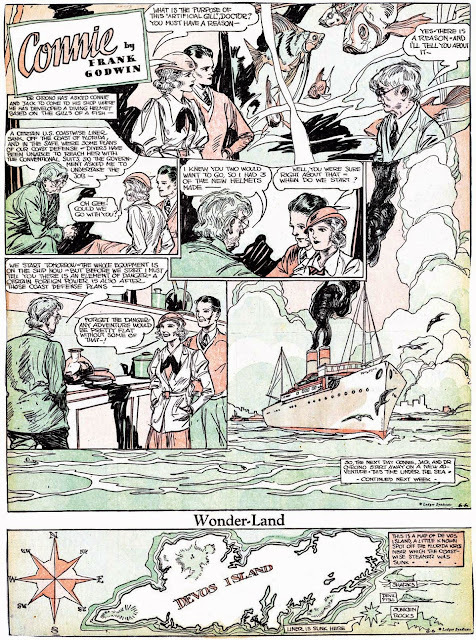 I can tell you that the strips I have are from 1944, and appeared in a comic section that otherwise mostly ran translations of Mickey Mouse and Big Chief Wahoo. I don't know if the paper was in the U.S. or not, as there are no mastheads. I guess really all I can say is that the strip sure does look intriguingly bizarre, sort of a fairy tale about kids in a fantasy land of some sort. The art, by Hugo Tilghman, is delightfully goofy and goofily delightful. With the help of Google Translate, I have managed to halfway read a capsule bio of Mr. Tilghman, which mentions Tito y Chita, as well as another Sunday-style strip I have in this pile of Spanish comics, Dos Mexicanos en la Guerra. Seems they both ran in a paper by the name of El Universal, but additional searching seems to indicate that there are several Central and South American papers that go by that name. Sounds also like Tilghman died terribly young, at age forty. The writer, Hipolito Zendejas, gets lots of hits in a Google search, but none that I could parse well enough to get any biographical info. Anyone reading have enough command of Spanish to help out with background about this interesting strip? This is from El Universal, of Mexico City. They produced their own stuff in addition to the translated word balloon U.S. comics in their Sunday section, which was rarely seen in Mexico. I'll gladly translate anything you need. I am Spanish and a professional translator, too. Just send me an email with the links or the texts you need translated! I love your blog (and also purchased your book, of course). Launched by King Features on December 7 1992, Galacto Guys was a rare attempt at sci-fi comedy on the comics page. The simple plot concerns a pair of dim-witted space explorers, Lenny and Punky, exploring strange new worlds, meeting exotic aliens, and trying to sell them junk from their employer, an intergalactic trading company. 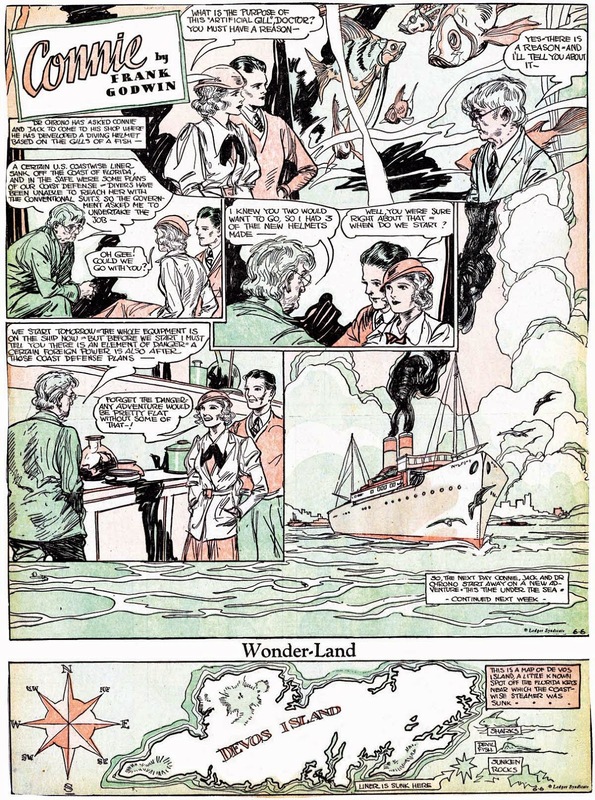 Given the small space in which cartoonist Steve Cole had to work, he opted for a simplified approach to the art which gets the job done perfectly, even if it doesn't bring Alex Raymond to mind. 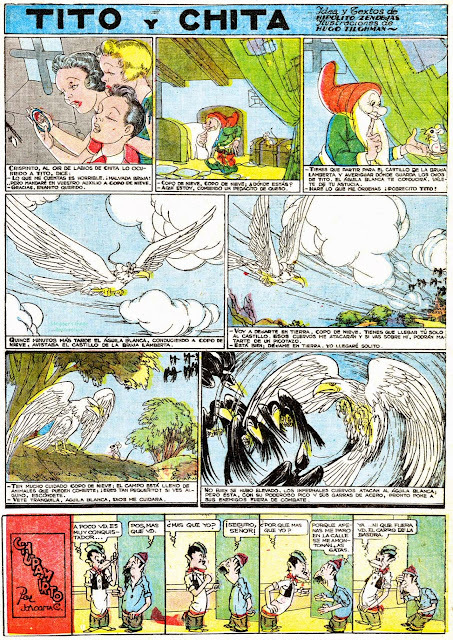 The strip is often quite funny, and since it treads very different ground from anything else on the comics page, tends to stand out. So then why is it an Obscurity of the Day? I really don't know. It seems to me it had a lot of ingredients for potential success -- originality, simplicity, and an endless well of joke fodder.. But my impression is that the strip began with a tiny client list, and didn't gain any more with time. In fact, I've seen the strip in papers so rarely that I can only say that it presumably ended sometime in 1993, but you couldn't prove that by any paper I've reviewed. If anyone can supply a definite end date or suggest a paper that I should review to find it, I'd love to hear from you. 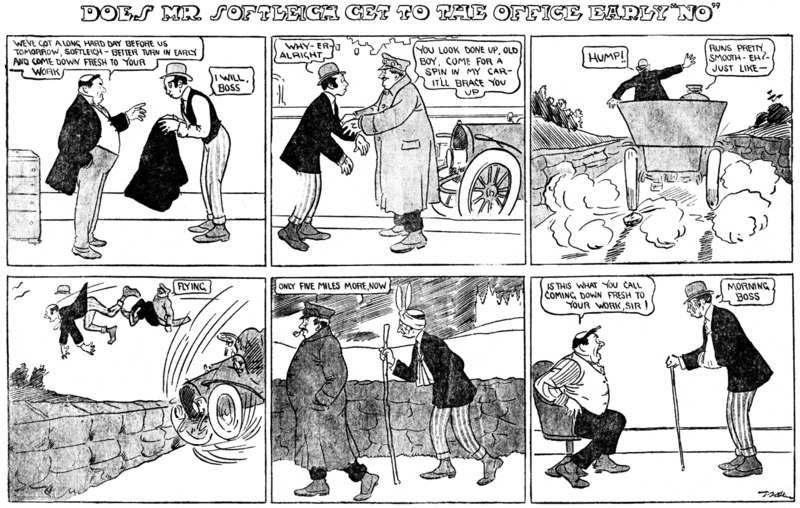 Galacto Guys is Steve Cole's only known newspaper comic. His primary profession was teaching, and I presume the strip was an experiment in changing the direction of his life that simply didn't pan out. 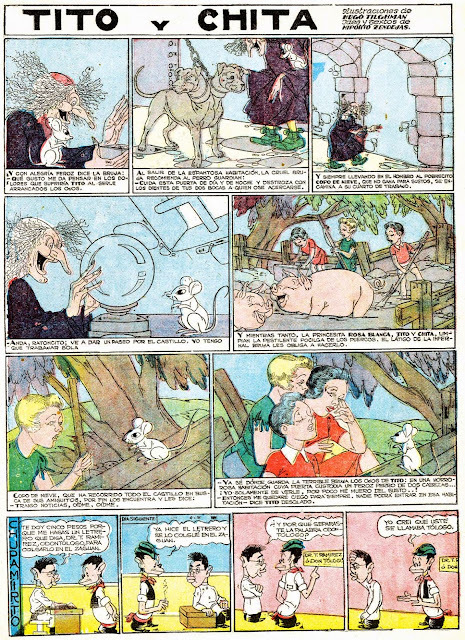 In a 2010 interview with his alma mater, Northern Arizona University, he mentions a passing interest in art, but makes no mention of cartooning at all. Here is the web page of a relative (son?) of Steve Cole. There is a pic of what appears to be a book collection of GALACTO GUYS, improbable as that might seem. Also a contact button! Seems to be Steve's brother. The Galacto Guys item is not a book, but rather the syndicate promo (I have the same one). Thanks for the clarification, Allan. I saw that press kit at Worldcat as an item in a few library holdings. Hope Tom Cole can provide further info! Great strip, if you beleive it!!! The final episode of Galacto Guys was Sunday, 5 September 1993. I wrote the Galacto Guys. Jerry Scott (Baby Blues, Zits) whom I met through the artist and cartoonist Bob Boze Bell (Honkytonk Sue), gave me some rudimentary tips on submitting the strip and I sent some rough samples to King Features. To my astonishment, within a week Jay Kennedy called me talking syndication. A lot of papers bought the strip and paid for it every month, but not enough bothered to actually run it. It died on the vine after a year or so, though some papers continued running it for a couple more years. I drew a few panel cartoons a couple of which Jay published in his New Breed project, but I got distracted by other interests and I haven't bothered with cartooning for many years. The only other publishing project I have done is a book called Quicksand and Blue Springs: Exploring the Little Colorado River Gorge, which was published by Vishnu Temple Press. It was a the result of a 40-year backpacking obsession that continues to this day (I just returned from Chile's Patagonia region after an eight-day hike in the Torres Del Paine wilderness). It was a lot of fun dreaming up the Galacto Guys jokes and drawing the strip and it was great working with Jay Kennedy who was a wonderful guy who died way too young. The last time I spoke to Jay he said Galacto Guys was still among his favorite strips, but that was, I suspect, just his overall niceness talking. I love it that Galacto Guys has become the obscurity of the day! It certainly deserves the title! Thanks for visiting, Stephen! You have a lot of cartoonists very envious when you say you basically just sent in some roughs and emerged with a syndication contract. Many fine cartoonists submit for years without anything clicking. It's a shame that the strip didn't work out, but it sure sounds like you have plenty of other interests in your life, so it wasn't the crushing of a lifelong dream! Good luck with your other endeavors! I suppose I should wait until closer to Christmas to post this, but I just discovered it, and I'm pretty excited. This page of greetings from the features staff of Christian Science Monitor, published in the December 21 1942 issue, features all sorts of neat stuff. 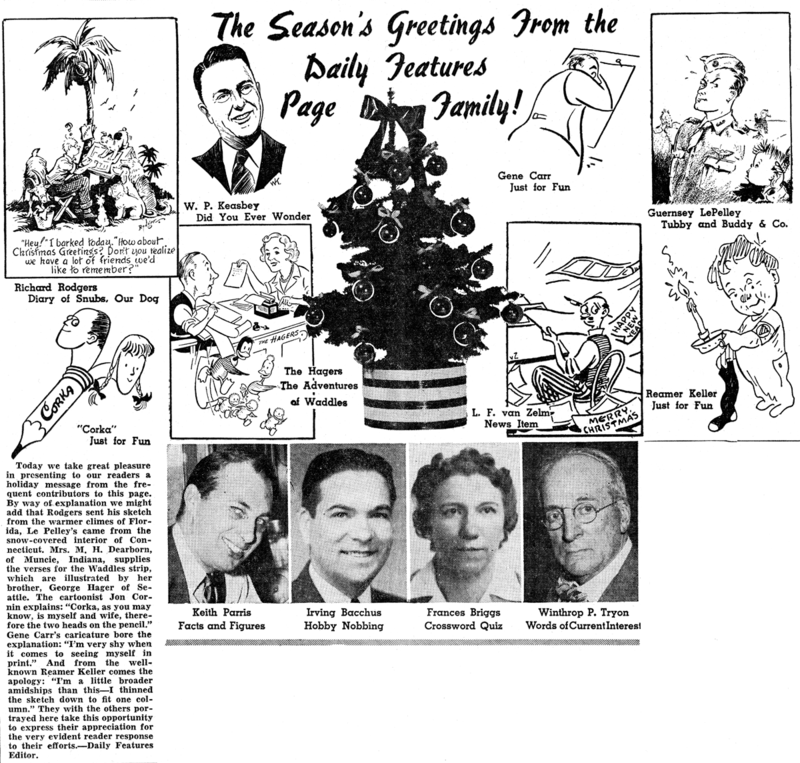 We get self-caricatures of their daily comic strip crew: Richard Rodgers (Diary of Snubs our Dog), Guernsey LePelley (Tubby and Buddy and Company), L.F. Van Zelm (News Item) and George Hager and Mrs. M.H. Dearborn (Adventures of Waddles). From Just for Fun, the multi-cartoonist gag panel, we get a delightful self-caricature of Gene Carr, a very hurried sketch from Reamer Keller, and we discover that cartoonist Corka is actually Jon Cornin and his unnamed wife (who turns out to be Zena Kavin). We also learn that the K. Parris behind the Facts and Figures panel owns a first name. I remember the story you told, I believe about your brother [uncle?] 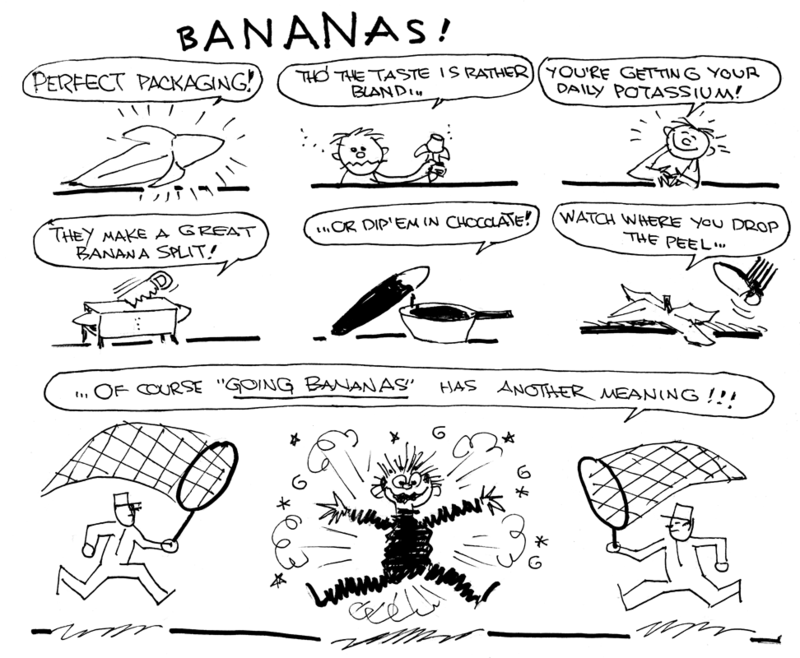 who almost died and crawled to a bowl of bananas!